"There was a racket like a flock of crows eating a bunch of canaries—whistles, cackles, caws, trills, and what have you. I rounded a clump of stumps, and there was Tweel!" Well, I certainly would. That's from the first few pages of "A Martian Odyssey" by Stanley Graumen Weinbaum, originally published in the July 1934 Wonder Stories. A year and a half later, Weinbaum died of throat cancer. In between, he published a dozen more stories, including "Valley of Dreams," [i] which also featured "Trrrweerrll," his enduring (and endearing) ostrich-like alien. More would come later, bringing the total to twenty-seven shorts; he would publish only one novel during his short life[ii], The Lady Dances, and that as a newspaper serial under the pen-name Marge Stanley. Again, a few more would follow his death, but clearly his métier was the short form. The root of this is simple, if crass: short work was easier to sell to the pulps than long, and this was the middle of the Great Depression. So what's the big deal, anyway? Just another dead writer, hacking away at pulpish bug-eyes, right? No. Not by a long shot. Weinbaum wasn't prolific, but he did something no other sf writer had done before him: he created an alien that really was, y'know, alien. Prior to Trrrweerrll (or Tweel, or Tveel, depending on whether or not you're a Putz [iii])—and for quite a long time afterwards, in the case of less adventuresome writers—most aliens tended to be thinly disguised humans in rubber suits with the zippers plainly visible. And funny hats; can't ignore those funny hats. There was a reason for this, above and beyond a lack of imagination on the part of half-cent-a-pop wordsters more concerned with the rent and groceries than creativity: aliens are frequently used as fun-house mirrors of human frailties, foibles and foolishments. A good reason, don't get me wrong; but suitable more for allegory and/or satire than nutzenbolts science fiction. Some are still doing it, to greater or lesser effect, depending on the madness of their skills. Skill was something Weinbaum had. Don't get me wrong, there are plenty of rough edges in his work, but he was a consummate story teller, and that's of far more use than mere smooth prose. As you may have noticed, storytelling is a thing I value quite highly, and also something I keep separate from grammar and spelling. I can forgive quite a bit of the latter if the former is strong enough. Stanley G. was born in Kentucky in 1902, or 1900, depending on which unassailable reference you use for research. His family moved to Milwaukee, and he attended the U. of Wisc where he studied chemistry. He did not, however, graduate; stories differ, but the one I hear the most concerns his having taken an exam for another student on a bet and getting caught. Hey, I did worse stuff than that, I kicked in my dean's door once. Or twice. But this made it even harder for him to make a living for himself and his wife, Margaret. So, he started knocking out witty, eminently readable yarns, exactly the sort of thing editors wanted. Believe me, as much as editors love to say they want the cutting-edge, the cold actuality is that the majority of their readers want stuff that they can, in effect, fall through without hitting the sides—i.e., stories that are fun to read without making their skulls sweat. That Weinbaum's were also damn good stories, written so well that they still work after three-quarters of a century, is both beside the point and tribute to his innate sense of what makes a narrative work. 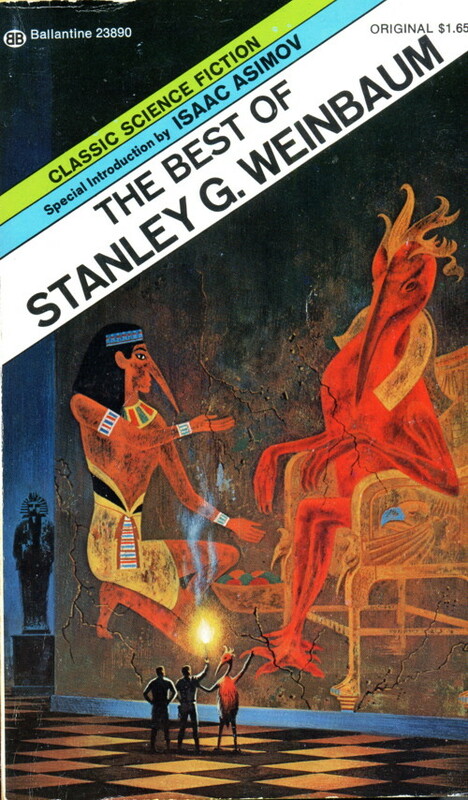 This is not to say that he was the only pulpster who transcended the medium: C. L. Moore, Leigh Brackett, Manly Wade Wellman, and Clifford Simak certainly did, among others. Weinbaum, however, managed to do it in eighteen short months, and almost from the very beginning. One gauge of his skill is the fact that when Robert Silverberg went to the membership of SFWA to assemble the first volume of The Science Fiction Hall of Fame, the earliest story they chose was "A Martian Odyssey" and it received the next to the highest number of votes. This means more than you might think on first consideration. The contents weren't just picked to fill a book, but to present to the world those stories published before 1965 that were of Nebula quality, as determined by the very people who would have awarded that honor had it existed at the time. ["A Martian Odyssey"] had the effect on the field of an exploding grenade. 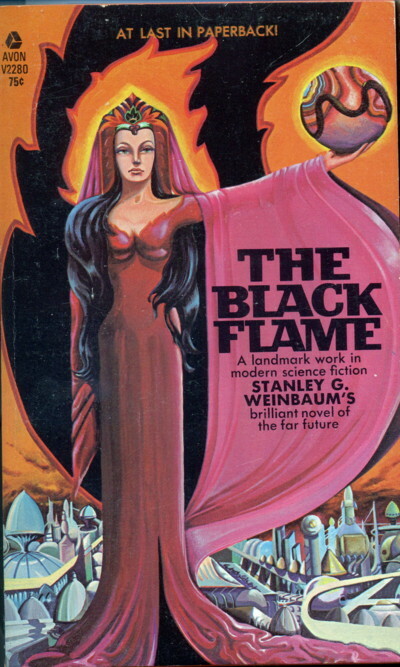 With this single story, Weinbaum was instantly recognized as the world's best living science fiction writer, and at once almost every writer in the field tried to imitate him. It was not just the realism of his alien other-world creatures, but it was his light and easy style, a far cry from the creakiness of the writing of most of the s.f. authors of the early thirties. That would be a big ten-four, stfnal good buddy. Reading some of the Gernsbackian science fiction of the period (no matter where it was published) is a bit more than a minor chore; characters are tissue-thin, plots contrived and unbelievable, and dialogue filled with clumsy "As you know, Borm-123K, here in the Future we . . ." tropes. Stanley Weinbaum, practically all by himself, changed all that. The other writers in the field had to run damn fast to catch up. Somehow he had the imagination to envisage wholly alien situations and psychologies and entities, to devise consistent events from wholly alien motives and to refrain from the cheap dramatics in which almost all adventure-pulpists wallow. Maybe you're inclined to argue with the father of The Great Lord Cthulhu, but I'm sure as hell not, so deal. What makes the story even more remarkable is that it preceded and anticipated the Campbellian Age of sf. Campbell is famous for giving his authors story ideas, frequently passing out the same suggestion to multiple writers and thus getting utterly different takes on that single germ. One legendary dictum would seem to fit Weinbaum's first story perfectly: "Write me a creature that thinks as well as a man, or better than a man, but not like a man." Weinbaum, who predated Campbell's tenure at Astounding, would seem to have been prophetic in fulfilling that request. 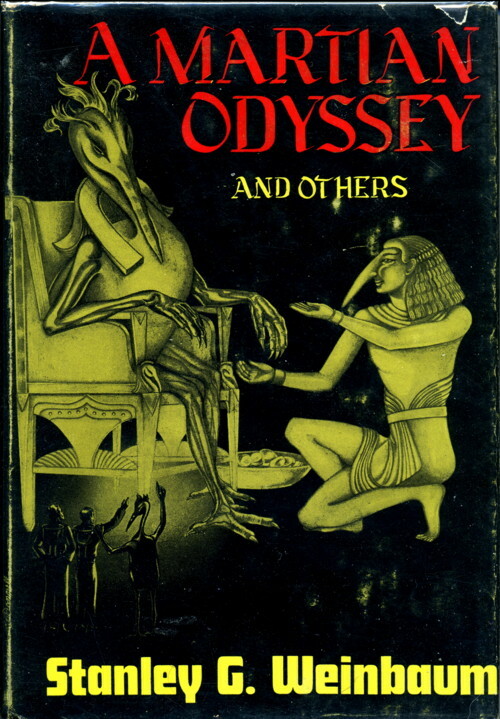 Everything Weinbaum wrote is measured against "A Martian Odyssey," which is, perhaps, unfortunate. Nothing unusual about this, of course; everything Asimov wrote for a couple of decades was compared to "Nightfall," and I'm sure that Richard Matheson is weary of everything he wrote being weighed against "Born of Man and Woman." In Weinbaum's case, though, it's even more unfair because he didn't live long enough to accumulate a body of work that would outshine his initial foray into the field. Damn shame, that, because there's enough shine on his other stories to light up a total eclipse. I liked it ["Flight On Titan"], of course, but "The Parasite Planet," in the very next issue, was what hit me with the force of a pile driver and turned me instantly into a Weinbaum idolater. I'll mention one more Asimovian riff and then shut the hell up about him. He posits in his intro to The Best of Stanley G. Weinbaum that the early history of science fiction was illuminated by three supernovae, stories which succeeded in ". . . altering the nature of science fiction and converting every other writer into an imitator"; the first being Edward Elmer "Doc" Smith's collaborative[v] first story, a serialized novel beginning in the August, 1928 Amazing titled The Skylark of Space, and the third being Robert Anson Heinlein's debut in the August, 1939 Astounding with "Life-Line." 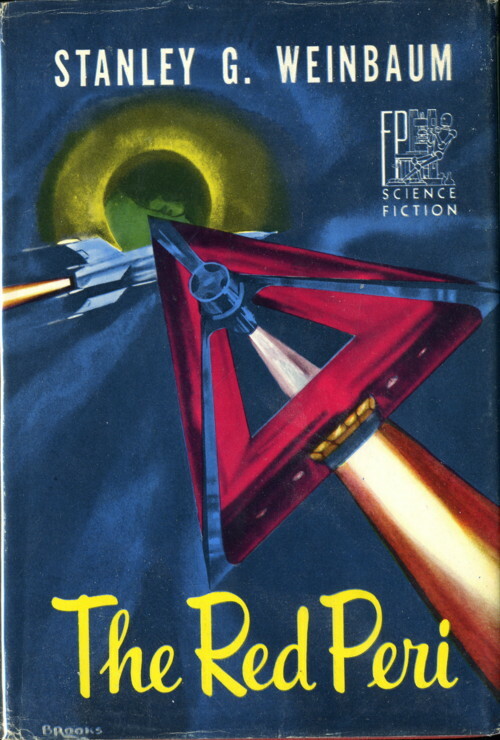 Need I say that the second super-nova was Weinbaum's inaugural foray into scientifiction? I didn't think so. "So what's happened to Kyra Zelas, by some mad twist I don't understand, is that her adaptive powers have been increased to an extreme. She adapts instantly to her environment; when sun strikes her, she tans at once, and in shade she fades immediately. In sunlight her hair and eyes are those of a tropical race; in shadow, those of a Northerner. And—good Lord, I see it now—when she was faced with danger there in the courtroom, faced by a jury and judge who were men, she adapted to that! She met that danger, not only by changed appearance, but by a beauty so great, that she couldn't have been convicted!" He paused. "But how? How?" That's a quote from "The Adaptive Ultimate," originally published in the November 1935 Astounding under the pen-name John Jessell. Now, I'm going to be honest here. This ain't the best-written tale I've ever read, not even close. It's not even Stanley G.'s best. But there a decent story hiding in there, and it's worth the minor hassle of coping with a little clumsy phrasing and awkward syntax. I've seen infinitely worse in a couple of decades of sitting in on convention workshops and writers' groups (not mine, of course—my guys are terrific). The conceit is fairly simple, and echoes the sort of super-science yarn Hugo Gernsback got all sweaty over. A physician fiddles around with putrefied fruit-flies and creates a serum that he claims will cure anything. He and his buddy, another doctor, inject a dying woman with the serum, and, whaddaya know, it works. Too well, as it turns out. See, she adapts. Instantly, and to anything and everything in her environment. And so it goes. There are, of course, unforeseen circumstances, but there wouldn't be much of a story if there weren't. Said circs verge on the tragic, but there's love in the air and in the end, lessons are learned by all and sundry, and a sort of normality is restored. As I said, it's a better-than-fair story, but there are lumps and ridges where there shouldn't be. For example: "Somehow it angered him that she should be so beautiful and at the same time deadly with an inhuman deadliness." Yeah, that's lumpy prose. Nevertheless, the story is well worth reading, if you can bear in mind the context: 1935 pulp fiction. Believe me, there's worse out there. "Bah! Would you mention them in the same breath with the name of van Manderpootz? A pack of jackals, eating the crumbs of ideas that drop from my feast of thoughts! Had you gone back into the last century, now—had you mentioned Einstein and de Sitter—there, perhaps, are names worthy to rank with or just below) van Manderpootz!" That's from one of my favorite Weinbaums, "The Worlds of If," which originally ran in the August '35 Wonder Stories. It's a good enough introduction to Prof. Haskel van Manderpootz (jeeze, I love Weinbaum's character names! I mean, if you're gonna be slapstick about it, go ahead and leap over the top, right? ), Stanley G.'s entry in the Mad (or at least quirky) Scientist rodeo. It seems he'd transferred to N.Y.U. as head of the department of Newer Physics—that is, of Relativity. He deserved it; the old chap was a genius if ever there was one. . . . The premise with this one is almost recursive—van Manderpootz invents a "What If" machine, the subjunctivisor, which shows What Might Have Been just like his fellow crazed scientist Hubert Farnsworth's[vi]. Based on the (equally fictitious) "Horsten psychomat," one plugs oneself into the machine, watches the blobs of color floating across the screen, twiddles a dial, and . . . well, it's a pulp story, and it doesn't have to make much sense. Just sit back and enjoy the story and forget the science for once, okay? Just like a Robert Sheckley story. The problem is, our friend Wells is habitually late for everything, so no matter what the subjunctivisor shows him might happen, he manages to blow it. Gee, none of us have ever done that, have we? There are three van Manderpootz stories, and they're all fun to read, something I'm finding rarer and rarer these days. I suppose I could make the case that van Manderpootz was a precursor to such later characters as Henry Kuttner's Gallegher, Nelson Bond's Lancelot Biggs, or Sterling Lanier's Brigadier Ffellowes. Problem is, none of them are practitioners of insane-o-science. They're certainly all quirky as hell, though, and even van Manderpootz has his literary ancestor in the person of Arthur Conan Doyle's Professor Challenger. Weinbaum wasn't the only writer in the Milwaukee area. Robert Bloch, Ray Palmer (editor of Amazing and flying saucer maven), Roger Sherman Hoar (who wrote as Ralph Milne Farley), Fredric Brown and a few others banded together as the Milwaukee Fictioneers, mostly to party hearty, but also to critique each other and talk shop. 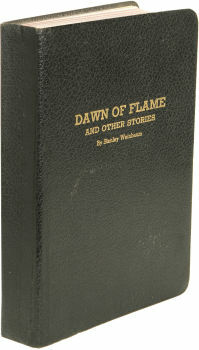 Weinbaum was a member in excellent standing, and upon his death, they arranged to have Conrad Ruppert, fan and printer, produce a memorial volume titled Dawn of Flame. Published in an edition of 250 copies, there were two versions: the first one with an introduction by Palmer, to which Weinbaum's widow objected; there were only five copies of this version issued. The second, far more plentiful (if you can use that term with any book limited to 250 copies) version replaces the Palmer intro with one by fellow Fictioneer Lawrence Keating. The book, as you can imagine, sells for a significant sum when offered at all. A search of eBay turns up no sales of the title in the past year, but long-time bookseller and bibliophile Lloyd Currey recently sold a copy for $2500. In 35 years of collecting and selling sf/fantasy books, I've only seen one copy myself, and that one came from Ruppert's own library. The book itself is interesting, as Ruppert primarily printed and bound bibles. Thus Dawn of Flame is bound in limp leather with the title and author's name stamped in gold on the cover and spine.
. . . Stanley Weinbaum told his tales almost as well in person as in print. He had a true storyteller's presence and dramatic delivery, and he seemed to enjoy the reactions of his audience . . . [His] questions usually concerned characterizations—ways to build credibility in his nonhumans as well as his humans. 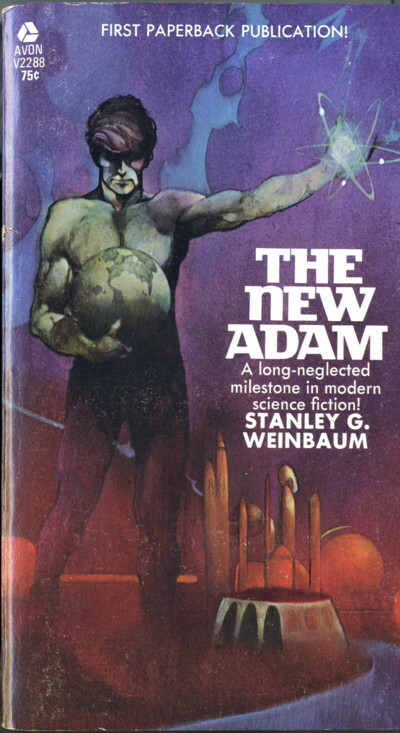 This, of course, was Stanley Weinbaum's greatest contribution to science fiction. He introduced empathy to the field. In an era of rising racial, religious and nationalistic discord . . . Weinbaum somehow found the courage and creativity to present—without plea or preachment—the case for brotherhood. Indeed, the relationship between Jarvis and Tweel (however you choose to spell and/or pronounce it) is clearly one of equals. Jarvis might be amused by Tweel's actions, but he takes his companion in adversity seriously and gives him his props to the other humans. Let me close this out by expanding on the first sentence of that last paragraph. People read for various reasons, both individually and overall. Speaking personally, I read for enlightenment, for knowledge, for entertainment. And, since I was just a kid reading about cats in hats and off-color breakfast foods, just for the fun of it all. It's simple, really. If I'm having fun, if I'm enjoying what I'm reading, it matters less if the prose isn't elegant or the style is less than blank iambic pentameter. Don't get me wrong, now, I'm as big a fan of lobster thermidor and oysters Rockefeller as the next gourmet, but there are plenty of times when what I really want is a chicken-salad sandwich with American cheese, toasted, and a frosty mug of IBC root beer. Cordwainer Smith, Harlan Ellison, James Tiptree, Jr.: they weren't just wordsmiths or craftsmen; they set out to create art. By and large, in my less-than-humble opinion, they succeeded. Stanley Grauman Weinbaum wasn't about art, he was about having a good time; and passing that good time along to his readers was his ultimate goal. Hey, I may know a lot about art, but I know what I like, too, and I like Weinbaum. Give him a chance, and I think you will, too. [i] In the November '34 Wonder. [ii] He had written two more, but they remained unpublished until after his death. This makes Weinbaum one of the very few writers, in or out of the field, whose posthumous output exceeded their life-time credits. [iii] That, I say, that's a joke, son. Mary tells me I should let you all know about these more often, her words being "give them fair warning." [iv] A title I hope to cover at another time, and in another place. [v] With Mrs. Lee Hawkins Garby, wife of Dr. Carl DeWitt Garby, a classmate of Smith's at the U of Idaho. Like you'll remember that. [vi] You do watch Futurama, don't you? Coulda been worse, too, it coulda been the FingLonger. [vii] He was invited to join the Fictioneers at age eighteen after they saw a newspaper article about his selling "The Feast in the Abbey" and "The Secret of the Tomb" to Weird Tales in 1935.